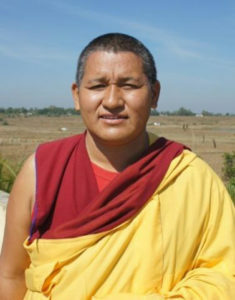 Geshe Thupten is the eldest of two sons and became a monk at the age of eight at his local monastery, Dhankar. At the age of seventeen, he moved to the Gaden Shartse Dokhang monastery in order to advance in his studies. He has received teachings and empowerments from many high lamas of the Gelugpa tradition and has received the highest degree, Geshe Lharampa. Geshe Thupten has taught Buddhist Philosophy at Gaden Shartse Monastery and has taught Dharma in Europe and the U.S. for many years. His Holiness the 14th Dalai Lama recently appointed him Lama Umze of Gyuto Tantric Monastic University. This is the first step on the path to Ganden Tripa, head of the Gelugpa lineage. Geshe la will return to Dharamsala to fulfill his duties as Lama Umze, but his teachings and guidance will remain with us. Venerable Geshe Lobsang Chophel entered the monastery at age 7. After nearly forty years of study and practice he has attained the highest Geshe degrees, Lharampa and Ngakrampa. 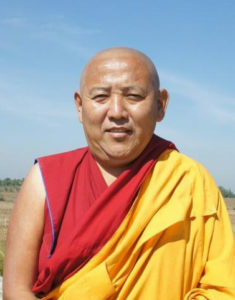 Geshe Chophel has studied with and received teachings and empowerments from many high lamas of the Gelugpa order including His Holiness the 14th Dalai Lama, the 97th Ganden Tripa, Kyabje Yongdzin Ling Rinpoche, and tutor of HHDL, Trijang Rinpoche. 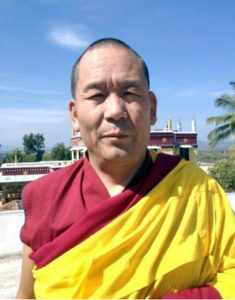 Geshe Chophel has achieved the highest training in both sutrayana and tantrayana practice. He has been a Professor of Buddhist Philosophy at Gaden Shartse Monastery since 1995 and also teaches in the U.S. and Asia. Geshe Chophel is the spiritual master of the U.S. Compassion Tour and is a senior student of Geshe Thupten Jinpa, Ph.D. (principal English interpreter for His Holiness the 14th Dalai Lama). 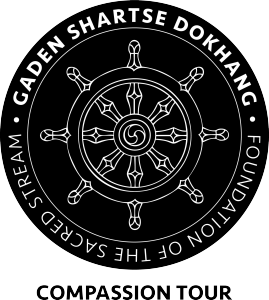 Geshe Dhonyoe is the eldest of 7 children and joined the Gaden Shartse Dokhang monastery when he was 5 years old. 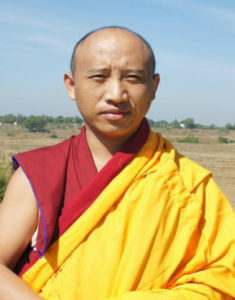 In addition to his natural talent for chanting, Geshe Dhonyoe has specialized training in chanting the liturgies. He has extensive knowledge in the history, philosophy, music, prayers, mantras, and meditative practices for numerous ceremonies and pujas, and has studied with many masters of the Gelugpa lineage. Geshe la is responsible for the accuracy of the chant and prayer texts and will lead all the chanting and prayers for teachings, pujas, and other community events. Geshe la will also provide tutoring and counseling on Tibetan Buddhist prayers and philosophy, as well as teaching culture classes. Geshe Gyaltsen became a monk at the age of ten. He has received special training and has advanced understanding and skills in the performance of ritual and Buddhist philosophy. He lives part time in Mexico working for the Office of His Holiness the Dalai Lama and assists with all aspects of His Holiness’s tours in Central and South America. 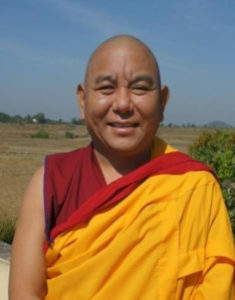 Geshe Gylatsen has extensive experience with touring and is the on-site tour manager for the Compassion Tour. 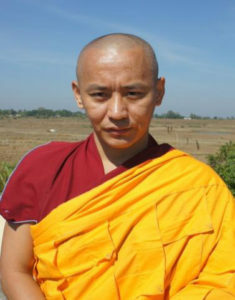 As a child, Geshe Thinlay expressed his wish to become a monk, and with his parents’ blessing, Geshe Thinlay became a monastic at the age of seven. Geshe la has received special training and has advanced understanding and skills in the performance of ritual and Buddhist philosophy. On the tour, he is responsible for conducting and overseeing different aspects of rituals and assisting the leader of the tour. 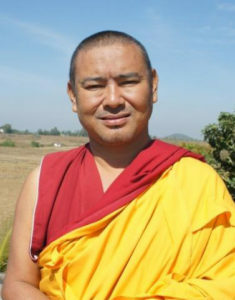 Geshe la will also teach culture classes and provide tutoring and counseling on Tibetan Buddhist prayers and philosophy. Venerable Tanzin Namgail has special training and advanced understanding of the creation of sand mandalas and performance of rituals. He is responsible for ritual knowledge, creating sand mandalas, and the ceremonies and practices associated with the monastery. He has extensive knowledge of all aspects of ceremony, including history, philosophy, ritual objects, and offerings, and has a deep understanding of the meditative practices and rituals (pujas) for each ceremony. He will be a main participant during the creation of sand mandalas and attend to the specific ritual procedures needed. Venerable Tanzin Namgail will teach culture classes on such topics as creating ritual sand mandalas and art. Nima joined the Gaden Shartse Dokhang Monastery at the age of ten and has received high training in the Black Hat dance through his monastic lineage. Nima also has special training and advanced skills in the creation of sand mandalas, butter sculptures and the performance of rituals. He is responsible for knowing the rituals, creating sand mandalas, and the ceremonies and practices associated with the monastery. He understands the history, philosophy, ritual objects, offerings, and understands the meditative practices and rituals (pujas) for each ceremony. Nima will assist with the creation of sand mandalas and attend to the specific ritual procedures as needed. He will also participate in culture classes on topics such as creating ritual sand mandalas and art. Raised in Tibet, an hour’s drive away from Lhasa, Wangdu joined the Gaden Shartse Monastery at the age of fifteen and, soon after escaped through the Himalayas to India, to avoid persecution. After an arduous trip he arrived at Gaden Shartse Dokhang in the Tibetan settlement in India. Wangdu is considered one of the best butter sculpturists in all of Gaden Shartse (some 1200 monks). He has special training and skills in the creation of these sculptures as well as sand mandalas. He also has extensive knowledge in the performance of rituals and comprehensive understanding of the history and philosophy of rituals, ceremonies, sand mandalas and monastery practices. Wangdu brings his sand mandala and butter sculpture skill to the tour and will help to create sand mandalas as well attend to specific ritual procedures and culture classes. At the age of eight Lungrik had a strong desire to be a monk. His parents did not agree at first, but after two years of considerable effort and persuasion his parents consented for him to join the Gaden Shartse Dokhang Monastery at the age of ten. 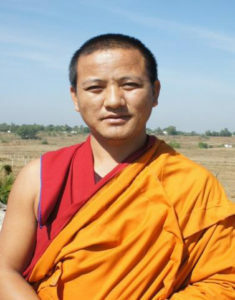 Lungrik received a scholarship to University and has achieved a high level of knowledge and understanding of Buddhism and the English, Tibetan, and Indian languages. He serves as the primary translator for the tour. With his linguistic skills and understanding of Buddhism, Lungrik is excited to be of assistance on the tour and expand his study of the English language and its application to Buddhist philosophy.